At Colac Chiropractic, we predominantly use the two traditional chiropractic adjusting styles referred to as "Diversified" and “Gonstead” techniques. Our Chiropractors are also trained in the myriad of modern and gentle approaches to spinal and musculoskeletal care. In deciding what type of care or treatment approach you require, first a postural and biomechanical analysis of your spine is performed. This can include a case history and an X-ray picture of your spine. Then, motion palpation, where the chiropractor feels the spinal joints move as you turn and bend, or other orthopaedic test will be performed, to uncover if any loss of function or imbalance in the spine exists. A System of Analysis - Early chiropractors noticed that vertebral subluxation complexes would produce the appearance of a short, or contracted leg. Using a protocol of comparing leg lengths while the patient turned their head, helped determine whether the subluxation was in the upper, middle or lower back. Terminal Point Table - What patients often notice first is our segmental "drop" table. Individual cushions or "drop pieces" located along our table surface, support each area of your spine until the thrust is delivered. Then, each drop-piece gently gives way, reducing the amount of energy needed to move a specific spinal segment. Popular and Patented - So unique is this approach, Dr. Thompson was granted a patent in 1955. Since then, because of its precision and patient results, it is a technique used around the world. chiropractic technique designed to help normalise the postural relationship between the pelvis and the head. is a chiropractic treatment method and device created by Arlan Fuhr as an alternative to manual manipulation of the spine or extremity joints. The device is categorized as a mechanical force manual assisted (MFMA) instrument which is generally regarded as a softer chiropractic treatment technique. 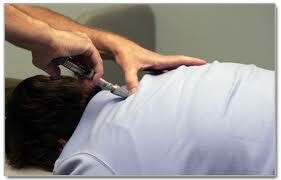 The activator is a small handheld spring- loaded instrument which delivers a small impulse to the spine. It was found to give off no more than 0.3 J of kinetic energy in a 3-millisecond pulse. The aim is to produce enough force to move the vertebrae but not enough to cause injury. The activator method chiropractic technique (AMCT) involves having the patient lie in a prone position and comparing the functional leg lengths. Often one leg will seem to be slightly shorter than the other. The chiropractor then carries out a series of muscle tests such as having the patient move their arms in a certain position in order to activate the muscles attached to specific vertebrae. If the leg lengths change, that is taken as a sign that the problem is located at that vertebra. The chiropractor treats problems found in this way moving progressively along the spine in the direction from the feet towards the head. Dry needling is the use of solid filiform needles for therapy of muscle pain, sometimes also known as intramuscular stimulation. Acupuncture and dry needling techniques are similar. Although the needles used have been called "acupuncture needles" and were described as such in the Huang Di Nei Jing in the Han dynasty and at one time were manufactured for use by acupuncturists they are now more properly referred to as solid filiform needles and are used in both procedures. Dry needling contrasts with the use of a hollow hypodermic needle to inject substances such as saline solution, botox or corticosteroids to the same point. Such use of a solid needle has been found to be as effective as injection of substances in such cases as relief of pain in muscles and connective tissue. 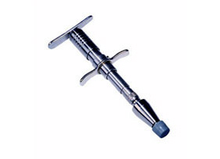 Analgesia produced by needling a pain spot has been called the needle effect. Dry needling for the treatment of myofascial (muscular) trigger points is based on theories similar, but not exclusive, to traditional acupuncture; however, dry needling targets the trigger points, which is the direct and palpable source of patient pain, rather than the traditional “meridians”, accessed via acupuncture. Our Chiropractors use a wide range of different methods adapted to suit people of all ages and body types, from newborns to the elderly. A child’s spine is subject to a range of stresses from birth. All births, particularly assisted deliveries, are stressful for a child’s body and can affect the baby’s developing spine and nervous system. Children's bodies also grow and develop at a rapid rate. As parents themselves, our chiropractors deliver suitable care to children based not just on knowledge, but on the experience which has seen their children excel.